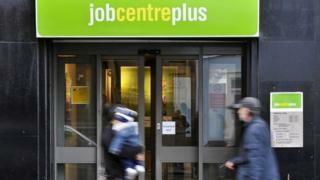 The number of people out of work and looking for a job in Scotland has fallen again. Official figures for May to July show Scotland's jobless total hit 113,000 - down 6,000 on February to June. The unemployment rate fell from 4.3% to 4.1% - but was up from 3.8% in the same period last year. Meanwhile, the number of Scots aged 16 to 64 who are in employment was 2,556,000 - down 6,000 on the quarter, and 32,000 lower than last year. That is a slight lower employment rate of 75.1 compared with 75.2 in the quarter before. The rate was 75.8 a year ago. For the UK as a whole, the employment rate was 75.5% and the unemployment rate was 4% over the period. Across the UK, wages, excluding bonuses, grew by a faster-than-expected 2.9%, compared with a year ago. Business, Fair Work and Skills Minister Jamie Hepburn said: "I very much welcome the fact that Scotland's unemployment rate fell over the quarter to 4.1%. "While these results show a very slight decrease in employment, comparing these figures against historical trends shows Scotland's economy and jobs market remains strong despite the continued challenges facing our economy as a result of Brexit uncertainty." Scotland Secretary David Mundell said: "The latest employment figures show that we cannot afford to be complacent. "Over the year, Scotland's performance is worsening, with employment falling and unemployment increasing. "It is important that the Scottish Government uses its extensive powers and works with us to create the right conditions to grow Scotland's economy and boost prosperity."